Wind turbine electric hubs present unique operational and maintenance challenges. Wind turbine technicians must pinpoint and resolve a wide variety of situations where the hub is key, especially in changing load conditions. Their troubleshooting and problem solving skills have to be excellent to keep wind turbines operational. 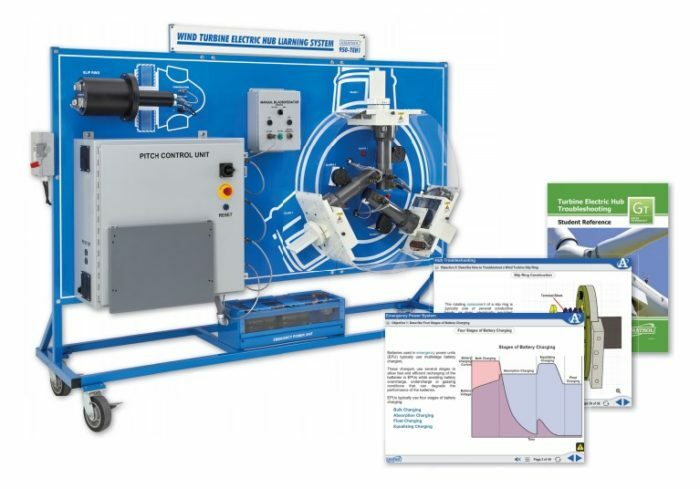 Amatrol’s Turbine Electric Hub Troubleshooting Learning System (950-TEH1) teaches learners adaptive skills for wind turbine operation, adjustment, and troubleshooting in a wide variety of situations. Turbine Electric Hub Troubleshooting allows learners to develop and practice component, subsystem, and system level skills. It is fully functional like a utility-scale turbine electric hub. Turbine Electric Hub Troubleshooting includes Amatrol’s unique electronic fault insertion system, which allows instructors to electronically create realistic hub problems and then track the learner’s progress in solving the problem. Additionally, Turbine Electric Hub Troubleshooting will connect to the Turbine Nacelle Learning System (950-TNC1) and the Turbine Generator Control Troubleshooting Learning System (950-TGC1) to create a complete wind turbine learning experience. Turbine Electric Hub Troubleshooting is an effective training platform for wind turbine technicians. This system includes a mobile workstation, blade simulator with 3-axis servo system, pitch control unit, emergency power unit, blade simulator, pitch control software, and fault insertion system. Turbine Electric Hub Troubleshooting enables learners to gain operation skills essential to wind turbine technicians. The system features pitch control software that allows a learner to start-up, test, and shut-down the hub portion of wind turbine systems. Turbine Electric Hub Troubleshooting includes major components found in utility-scale wind turbine electric hubs such as a pitch control unit, electric servo drives, brakes, slip ring, battery-powered emergency power unit, pitch position encoders, and feather position sensors. The system features 3-axes so learners can gain a visual understanding of the synchronized positioning of blade operation. Troubleshooting skills are essential for wind turbine technicians. At the heart of teaching troubleshooting skills is the ability of an instructor to create realistic problems or faults that learners can identify and resolve. It is what they will have to do, by themselves, on top of a wind turbine tower. Turbine Electric Hub Troubleshooting includes over thirty (30) faults distributed across all key subsystems – electrical and mechanical. This will allow instructors to create realistic troubleshooting situations that a wind turbine technician will encounter on the job. Amatrol uses electronic fault insertion so that instructors can easily insert faults and track the learner’s troubleshooting results. Electronic fault insertion prevents component damage while allowing instructors to see learner progress. Instructors can identify specific areas that the learner needs to improve and target those areas. It also allows instructors to set-up faults ahead of time, allowing learners to perform self-directed study when appropriate. While an independent learning system, Turbine Electric Hub Troubleshooting will also link to Turbine Nacelle Troubleshooting and Turbine Generator Control Learning Systems. These three systems combine to create a realistic operating and troubleshooting wind turbine environment. Fiber optic communications connect the controls of the three systems and control the entire system using the turbine control software, just as they would on a real wind turbine. Learners can even bring the turbine online with the grid. Amatrol’s unmatched multimedia utilizes text, audio, and stunning 3D animations that engage learners in both theoretical knowledge and hands-on skills. This thorough, exceptionally detailed curriculum is built to begin with the basics and steadily advance to more complex concepts and skills. Through partnerships with key industry leaders and leading edge educators, Amatrol developed the perfect balance of knowledge and applied skills needed to train learners to work in their chosen field.